Turns out my pledge to hold off on buying pens doesn’t stand a chance when the pen world offers up a handful of reasonably priced orange pens. It’s a conspiracy, I tell you! 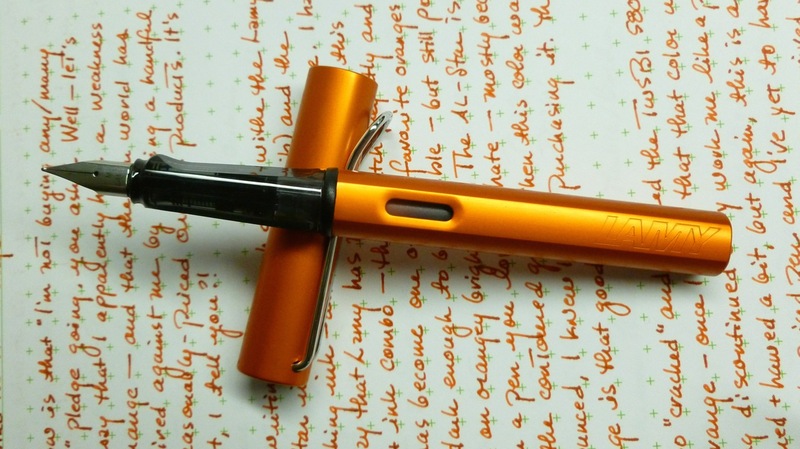 I wrote the rough draft of this review with my new CopperOrange Lamy AL-Star (medium nib), filled with the matching CopperOrange ink (cartridge). Lamy has, in my opinion, nailed it with this pen and ink combo. They match perfectly and this ink has quickly become one of my favorite oranges. It’s dark enough to be legible, but still pops with a nicely balanced brightness. The pen almost looks like it’s lit from within—warm and bright but still easy on the eyes. The AL-Star is a pen you either love or hate, mostly because of the iconic contoured grip. I have no issues with the grip so picking up this pen in this color was a total no-brainer. 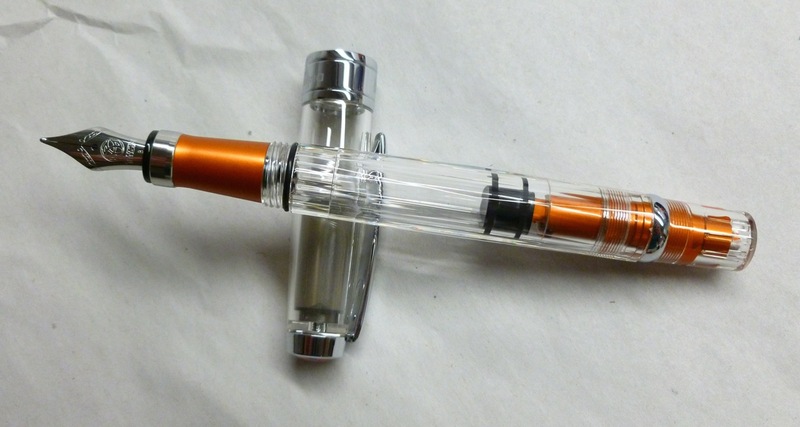 I also “cracked” and ordered the orange TWSBI 580AL when I read that the color was being discontinued. (They manipulate me like a pen-buying puppet!) I chewed on my pledge, but again, this is an affordable pen and I’ve yet to have a bad TWSBI experience. The pen arrived in Saturday’s mail, but the weekend was such a blur that I haven’t gotten around to inking it yet. I stepped outside of my nib comfort zone by ordering a broad, and can’t wait to see how it writes. My current dilemma—what ink should I fill it with? One of my oranges? Or a nice bright blue? Why I belabor this, I’ll never know. It’s not like it’s a permanent decision. I hear there’s a big basketball game on tonight, but I’ll be watching “The Voice,” then reading. 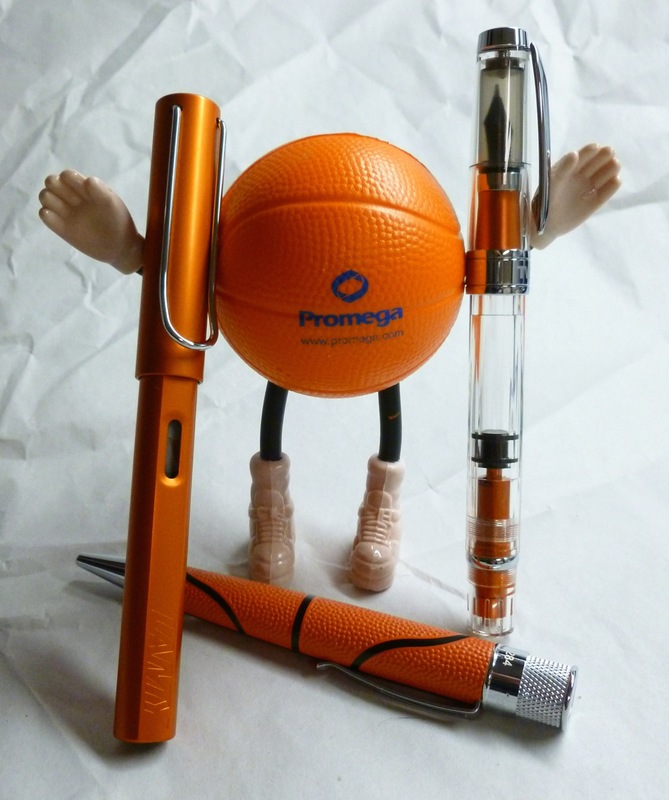 So…not really a basketball fan, but the Limited Edition SWISH Big Shot Tornado Popper by Retro 51 reeled me in with top-notch details and orangey goodness. 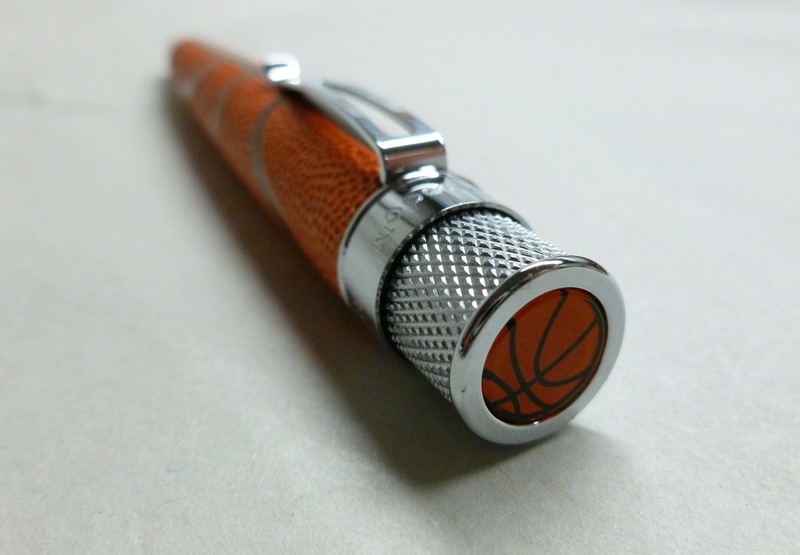 The pen is marked and textured like an actual basketball, features that classic Retro 51 knurling, and is finished with a very cool basketball graphic end cap. Though I don’t give a hoot if Wisconsin or Duke wins tonight, I do love using my SWISH pen with my usual “swapped in” Schmidt P8126 refill. So that pledge to pare down pen purchases has taken a little bit of a beating. 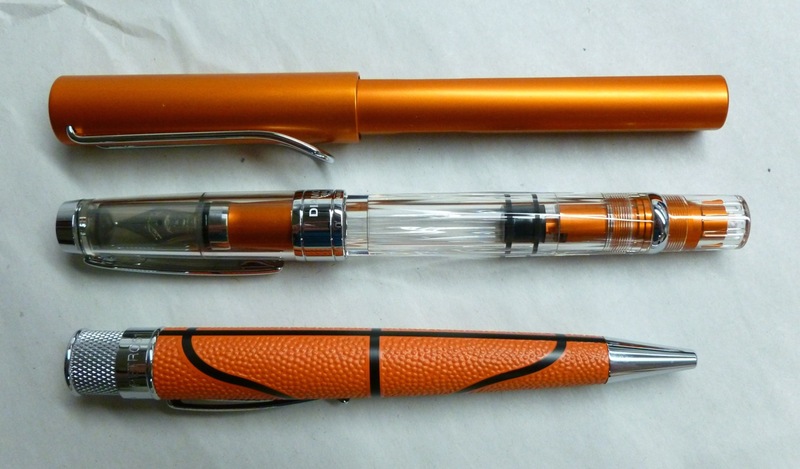 Lamy, TWSBI, and Retro 51—you had me at orange. I purchased the Lamy AL-Star from Fontoplumo, the TWSBI 580AL directly from TWSBI, and the SWISH Retro 51 from Anderson Pens. I experienced excellent customer service from all three vendors. There are no affiliate links in this post. I just enjoy sharing good pens and good buying experiences with you.